Just because Intel has yet again delayed its 10 nm silicon to 2020, if all goes well, that doesn't mean fans of the processors won't have anything to look forward to this year. We already know so much about Intel's upcoming Core i9-9900K except for the correct CPU clock speeds, and according to the latest rumors we could be in for a treat. These are the Intel Core i9-9900K (8 core / 16 thread), Intel Core i7-9700K (8 core / 8 thread), and Intel Core i5-9600K (8 core / 8 thread). The Core i7 9700K is an eight-core and eight-thread processor (that's right no Hyper threading) with a boost up to 4.9 GHz on one single-core. Long-standing system information software CPU-Z has added support for six new processors from Intel. Intel Core i9-9900K, i7-9700K and i5-9600K to launch in October - 08/01/2018 03:19 PMAlright, one more on Intel for today, I promise. First to be launched will be the company's unlocked, overclockable processors. 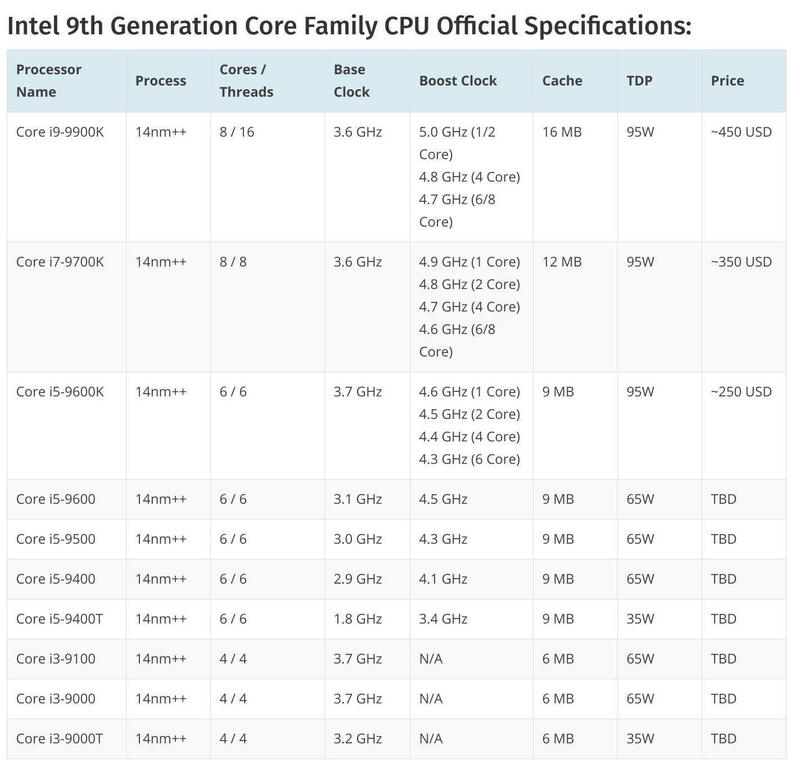 8 cores are what the Core i7 will get as well, granted, with 8 threads, while the Core i5 will feature 6 cores and 6 threads. The CPU is also said to come with 16 MB of L3 cache and Intel's UHD 620 graphics chip. The base frequency is 3.6GHz boosting up to 4.9GHz for two cores. The table below, courtesy of WWCFTech, includes the other 9-generation chips set for release next year. They all run lower clock frequencies, core counts, and TDPs, but won't arrive until Q1 2019 at the earliest with pricing yet to be confirmed.